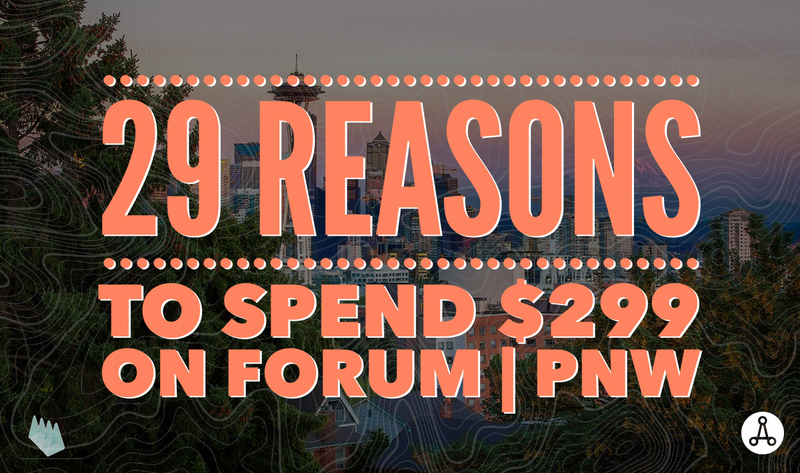 AIAS FORUM | PNW is around the corner, folks, and the early bird registration rate is only $299 if you register four or more members from your chapter. If you haven’t attended FORUM before, now is the time! AIAS FORUM is a must for members to experience the greatest member benefit of all – the AIAS community. FORUM will lend you the opportunity to interact with professionals, grow your network, tour the city of Seattle, attend impactful educational sessions, learn about the structure of the AIAS Council of Presidents, and maybe even make new friends. 1. Rule of thumb – Networking is always the number one reason to attend any AIAS event. 2. Are you an AIAS Chapter President? Well, you better be at FORUM so you can use your voice and vote for the next AIAS Board of Directors. 3. It’s back… don’t miss out on the magical experience that is Silent Disco. 4. Take a 35-minute ferry ride to visit Bainbridge Island, a small, quaint seaside village that possesses all the benefits of a big city. 5. Get to know your #AIASfamily by attending your respective Quad Breakout session. 6. Engage with schools and firms from across the country at the College & Career Expo. 7. Dive into city planning with Keynote Speaker Samuel Assefa, Director of Seattle’s Executive Office of Planning & Community Development. 8. You get to spend NYE in the great city of SEATTLE! 9. Get down to official AIAS business by attending the Council of Presidents meeting… it’s where all the decisions are made. 10. Watch the highly anticipated candidate speeches for the 2018-2019 AIAS Board positions. 11. Help us in celebrating the 2018 Honor Awards at the Honor Award Reception at MadArt. 12. Grace Kim, Principal of Schemata Workshop, will be keynoting the Equity track. 13. Take a tour of Amazon Headquarters. It has an indoor rainforest… enough said. 14. Because this year’s Beaux Arts Ball theme is World’s Fair–Emerald City and it’s going to be #lit! 15. Learn about sustainable building strategies with Keynote Speaker Eric Corey Freed. 16. Interested in becoming involved with the AIA after graduation? Lucky for you there will be an AIA Student Lounge onsite at FORUM. 17. Visit the iconic Pike Place Market. Here’s a guide on the 50 best things to eat and drink while you’re there. 18. Brooke Muller, professor of architecture at the University of Oregon, will be keynoting the History & Environment track. 19. Seattle is the birthplace of one of the largest corporations in the world: Starbucks. While you’re there, visit the Starbucks Reserve Roastery & Tasting Room. 20. Explore the Capitol Hill area by visiting the Bullitt Center, the greenest commercial building in the world. 21. Meet the AIAS National Staff in the flesh. 22. Visit the library that redefined the institution of libraries: Seattle Public Library. 23. Get your nature fill by visiting the Washington Park Arboretum. 24. See the transformation taking place at Seattle’s central waterfront through the Waterfront Seattle Program. 25. Steve McConnell, managing partner at NBBJ, will be keynoting the Technology Track. 26. Hit downtown Seattle and visit some of the greatest architectural sites in the country. 27. Take a break and grab a brew at one of Seattle’s top breweries this season. 28. Visit Seattle’s first neighborhood: First Hill. 29. Hungry? No problem. We’ve found a list of 16 of Seattle’s Best Cheap Eats.